why is it directions are soooooo hard to understand...? a foolish question-- i already know teh answer-- engineers with their logic put together a lovely machine often with a few "but at the same time i could also make it.......xxxxx" then they give it to the english department-- with their perfect spelling, paragraphing and semi colons-- often translated into french chinese and spanish depending on how you unfold the instruction sheet- then to save -- i am not sure what-- they include the instructions for model numbers 736G284b with 736G284a on the same paper-- teh difference is on model " b" you turn lever 14 left-- and on model " a " you turn it right- all teh safety instructions about electrucution and INJURING child operators are the same for both. so you get out the manual and it helpfully informs you that the model number is on the back side underneath a covering which can be easily removed with a star shaped screw driver. THEN I BOUTGHT A SMALLER ORANGE THING- WHICH WAS CHEAPER, PICKED UP SMALLER THINGS AND CUT TEH GRASS.- BUD DROVE IT .. MARK DROVE IT.. AND I GOT ON IT AND TURNED THE KEY--- IT ROARED INTO LIFE WITH ALL TEH ENTHUSIASM OF A BRAND NEW BATTERY. I WIGGELED THE FOOT THING WHICH MADE THE BIG TRACTOR GO FORWARD...AND IT DID-- ABOTU 2 INCHES. CLUNK-- MUST BE THAT THE BUCKET IS DOWN AND STUCK... MOVE LEVER TO RAISE BUCKET... WIGGLE... CLUNK... NOTHING. OK,,,, THINK.... ON THE BIG TRACTOR TEHR IS A LEVER AND HOOK THAT PREVENTS THE BACKHOE FROM DOING UNEXPECTED THINGS LIKE SWINGING SIDEWAYS AND WIPING OUT PARKED CARS.. TEH CLUNK SOUNDED LIKE THAT. THERE WERE 3 LEVERS WITH A CUTE PICTURE OF A LOCK OPEN AND LOCK CLOSED OK.. I COULD UNDERSTAND THAT..
NOW COMES THE HARD PART.. I KNOW THAT SOME OF THESE TRACTORS BRAG ABOUT HOW EASY IT IS TO PUT THINGS ON THEM AND TAKE THEM OFF... LIKE THE FRONT BUCKET... WHICH WAS THE ONLY THING ON THIS MACHINE AT THE MOMENT. DID THE "LOCKED" MEAN THAT THE BUCKET WAS LOCKED IN PLACE READY TO USE--- OR ONE OF THOSE "BUT WE CAN" EXTRAS WHERE LOCKED MEANS IT IS LOCKED TO PREVENT THE UNINTENDED USE. UNLOCKING ALL 3 NEARLY MADE TEH LOADER FALL OFF- NEARLY--- WHICH MEANT IT WAS NOW NOT STRAIGHT -LUCKILY CHIP WAS HERE ..... WE GOT TEH MANUAL OUT-- IT DID NOT HELP BECUASE IT NEVER DEFINED TEH PIECES THAT IT TALKED ABOUT... HE STTRUGGELED AND GOT THE BUCKET STRAIGHT AGAIN.. AND I WIGGLED LEVERS- ALL OF A SUDDEN IT DECIDED TO GO... AND WORKED PERFECTLY.. I STILL HAVE NO CLUE WHY-- SO WE NEED A SIGN ON ALL THOSE LOCK AND UNLOCK LEVERS "DO NOT LEVER"
MEANWHILE....... THE GRASS GROWETH !! BOY DID I GET CHEMICAL LEACHING + GERMS STORIES--- REAACTING TO YESTERDAY'S DD ABOUT TRYING TO RECLAIM TEH PLAND SOPRINGS BOTTLES..... HOWEVER...ONE FDA REPORT NOTED THE NEGATIVE REUSE OF BOTTLES BASICALLY CAME FROM A STUDENT PAPER ? FROM IOWA? AND THE PAPER NEVER WENT THRU "PEER REVIEW"
The real culprits for the safety of reusing any water bottle are the bacteria and fungi that can grow in damp or partially full bottles once they have been opened. These bacteria generally come from your hands and mouth, or any dirt that comes in contact with the mouth of the bottle. MY HANGING UPSIDE DOWN WITH AN ELASTIC GETS RID OF THAT "REAL CULPRIT" .. ALL THE ARSINIC PROBLEMS ARE FAR WORSE IN BOTTLE WATER IN GENERAL-- THERE ARE FEWER RESTRICTIONS ON BOTTLED THAN COMMERCIAL PUBLIC WATER OUT OF THE FAUCET. THOSE SNAPP TOPS OF POLAND SPRINGS ARE VERY GOOD... I HAVE NOT SEEN ANY BETTER EVEN IN THE MILLION DOLLAR STAINLESS STEEL INDIVIDUAL SIPPERS... WHICH SUFFER THEIR OWN "DAMP" ISSUES UNLESS STERALIZED WITH ENTHUSIASM NIGHTLY. THEN------ SINCE I GOT GOING ON "DAMP"-- I ADDRESSED MY AVERSION TO ... THE KITCHEN SPONGE-- AN DSAW SOMEWHERE SOMEONE HAD CUT A BOTTLE IN HALF-- AND BY INVERTING THE TOP IN THE BOTTOM THEY HAD A MORE SANITARY SPONGE DRIP EPISODE GOING. THAT CAUSED ME TO GO TO EBAY------ IN AN EFFORT TO REDUCE TEH GERM LADEN DAMP PROBLEM WITH JUST A LITTLE MORE CLASS THAN A CUT OFF WATER BOTTLE( WHICH WOUDL WORK)-- TURNS OUT THERE ARE ALL SORTS OF FUN ANTI DRIP STRAINERS FOR BARS TO BATHTUBGS.... I SETTLED ON THE STAINLESS STEEL --DRAIN STRAINERS WHICH WILL FIT IN SEVERAL OF THE VERY NICE COFFEE MUGS WHILE HOLDING A KITCHEN SPONGE IN ONE AND A DIFFERENT 1 FOR THE BOTTLE TOPS . FIRST CAROLYN IS SPEAKING ABOUT HOW CLARK HELPS WITH HER ATAXIA.. I wanted to let you know that I will be speaking on a panel at an FDA meeting about rare diseases on April 29 in Silver Spring, MD. I will be talking about how having Clark helps manage my FA symptoms. The meeting is from 1-5pm, and I am speaking on the first panel. THE SECOND IS JANINE AND THE DONKEY PROJECT....REALLY A BELLY LAUGH 19 MINUTE DOCUMENTARY ABOUT DONKEYS.. I DID NOT REALIZE THAT THE BOSTON MARATHON IS THE OLDEST MARATHON IN EHT COUNTRY -- THE SECOND OLDEST IS A 15 MILE LEADVILLE COLORADO BURRO RUN--- WHICH TO ME BEATS TEH KENTUCKY DERBY HANDS DOWN-- OR ANY HORSE RACE-- FIRSTLY NO WHIPS ARE ALLOWED-- PEPPERMINT CANDY IS TH MOTIVATING FORCE-- WHICH DOES NOT SEEM TO BE NEEDED TOO OFTEN-- THE DONKEYS INTHE FILM SEEM TO BE ENJOYING THE ATTENTION-- IN ALL MY YEARS, I HVE NEVER SEEN ANY GROUP OF PEOPLE AND ANIMALS HAVING THE FUN THAT THESE FOLK DID. NOR HAVE I SEEN ANY SAFER AND AMUSING MIXTURE OF TEH GENERAL PUBLIC AND "COMP[ETING" ANIMALS OF ANY KIND. JANINE SENT OUT 4 DONKS TO COLORADO FOR SOMEOEN TO "GENTLE" AND GET READY FOR THIS "RACE"-- TO BE JOINED BY ?6 PEOPLE ? 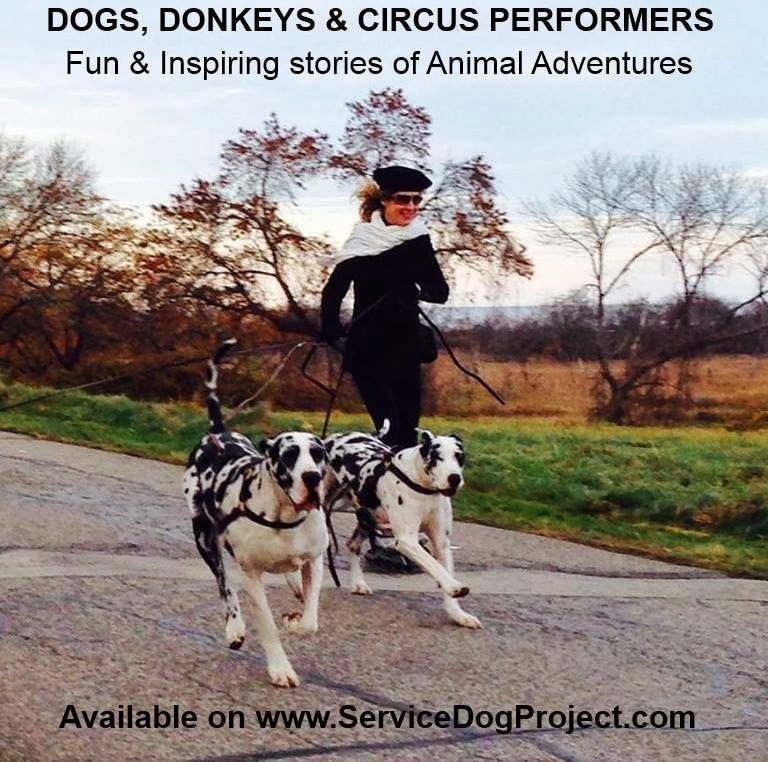 Are there any SDP military greeter dogs near Syracuse? There is a WWII Veteran Honor Flight on Saturday April 27th where they fly the World War II vets to Washington to see all the memorials. When they come back to the Syracuse airport there is a celebration honoring the vets along with the news media being there too. I just thought it would be fun to have a greeter SDP dog if there are any in the area? I AM TOLD BY REPORTS, THAT BOTTLED WATER RARELY COMES FROM ANY SPRING- IF YOU READ TEH LABELS YOU WILL SEE THINGS LIKE "BOTTELED IN BROOKLYN" WHICH IF TRUE I WOULD SEE A CONSTANT STREAM OF TANKERS ON RT 95 TRUNDLING WATER FROM MAINE TO BROOKLYN... I HAVE SEEN NONE. I was persuaded- by advertising-- to think buying 1 cup bottles would aleviate teh problem of leaving water on fence posts...-- so i bought a pallet of 1 cup sized poland springs... (?3000?) and was very smug--- i had made an effort ----until yesterday.... when linda asked me to buy the larger size because "THEY" WERE COMPLAINING About teh one cup size- " AND I THOUGHT----JUST WHAT IS THE SIZE OF TEH CONTAINER ( STOMACH) THAT IS TO RECIEVE "A DRINK" -- SO I TESTED... -- I CAN SWIG A CUP OF FLUID-- BUT ANY MORE IS A BIT UNCOMFORTABLE- AND THERE IS NO ONE AROUND WHO WILL QUESTION TEH SIZE OF MY RECIEVING RECEPTACLE...- SO THAT DEFINES A PROBLEM-- MORE THAN ONE CUP AND IT BECOMES MORE THAN A THIRSTY PROBLEM. SOLVE TEH PROBLEM -- DON'T JUST FUSS ABOUT IT. WELL THAT IS THE LAST BOTTLED WATER SDP WILL BUY-- BECAUSE FOR 99 CENTS AND ONE OUNCE OF INGENUITIY WE JUST WILL NOT NEED IT.. THIS LAST FEW CASES OF POLAND SPRINGS I BOUGHT HAS A DARN GOOD SNAP TOP-- SO I WILL "HARVEST" THOSE BOTTLES-- THEY WILL BE RINSED AND PUT THRU THE DISHWASHER'S (VERY HOT TEMP) THEY WILL THEN BE INVERTED AND SUSPENDED BY ONE ELASTIC BAND WHICH COMES DAILY WITH OUR MAil- from any nearby rack. or nail .... the tops (-- here comes the expensive part) you will need a collandar/ strainer to let the tops ventilate and drip if necessary. in the strainer also will be a bottle of nail polish-- for some creative marking-- if necessary... but will be recycled if left on the fence. now for the "YES BUTTS"-- DON'T I HATE THE "YES BUTTERS" !!! IT IS THE UPSIDE DOWN AIR DRY/ STORAGE THAT MAKES THIS ACCEPTABLE . PEOPLE DO NOT LIKE CHANGE-- I KNOW THAT--- IT TOOK US YEARS TO THINK WE HAD TO DRINK BOTTLED WATER.... THERE WE HAVE THE 'GET 'EM YOUNG, TRAIN 'EM EARLY" ---- IF BABIES AND AGING NEED SIPPIE CUPS, IT IS THE 6 TO 80 YEAR OLDS THAT NEED TO BE RETRAINED. BUT I AM ON IT. DOG FEST--- PERFECT FUN GAME--- CARRY A GALLON OF WATER ON YOUR HEAD FROM TEH BARN TO THE T-TENT-- I CANNOT THINK OF TEH REWARD I WILL OFFER-- BUT I WILL THINK OF SOMETHING !!! LAST WEEKEND, WE HAD THE PLEASURE OF GOING TO DINNER WITH TWO CPS (SASSYBELLE & ANITA, WHOSE NAMES YOU MAY RECOGNIZE)...WHAT A WONDERFUL COMMUNITY WHERE 3 COUPLES CAN ENJOY DINNER, AND WE ARE ALL BROUGHT TOGETHER BY OUR LOVE OF DOGS. SASSYBELLE WAS EXCITED TO MEET SEAGRAM. SHE HASN'T MADE IT TO CRAZY ACRES TO VOLUNTEER LATELY, SO IT WAS NICE FOR HER TO ENJOY THE COMPANY OF A DANE. AND WE ENJOYED MEETING SASSYBELLE AND SEEING ANITA AGAIN. SEAGRAM DIDN'T FALL ASLEEP IMMEDIATELY, AS SHE OFTEN WILL DURING A DINNER OUT. RATHER, SHE WATCHED THE TRAFFIC AT THE FRONT DOOR, SINCE SHE WAS POSITIONED JUST OVER 2 FEET FROM THE ENTRANCE. ANITA WAS ESPECIALLY INTERESTED IN HOW SEAGRAM WAS UNAFFECTED BY THE STREAM OF ADULTS AND CHILDREN COMING & GOING, MOST OF WHOM DIDN'T EVEN NOTICE HER BECAUSE SHE WAS SO WELL-BEHAVED (UNLESS THEY HAPPENED TO LOOK DOWN DIRECTLY AT HER). DURING DINNER, WE WATCHED A PERSON OUTSIDE STRUGGLING TO CARRY A RATHER LARGE DOG THAT WAS SQUIRMING SOME (A GOLDENDOODLE?) - WHAT A CONTRAST TO SEAGRAM POLITELY SITUATED ON HER FLUFFY. SHE EVENTUALLY FELL ASLEEP AS THE TRAFFIC QUIETED SOME. IT MAY NOT SEEM LIKE A BIG DEAL TO GO OUT TO DINNER, BUT BACK WHEN I WAS USUALLY USING A WALKER, THESE ADVENTURES WERE QUITE CHALLENGING (EVEN IF I COULD SOMETIMES DOWNSIZE TO A CANE). HOW GREAT IT IS TO BE ABLE TO GET OUT MORE EASILY - AND TO MEET SUCH NICE PEOPLE. THANK YOU FOR SEAGRAM AND THE WONDERFUL COMMUNITY THAT COMES WITH HER! thinking it would be empty i had not only bentley and sizzle-- but chaos decided she needed to come for teh ride.- i went in with bentley and sat for a bit... so many people came to pat him that i finally took off his vest and collar so i didn't hae to answer question s about may i pat him??? it took a while-- and i had 2 more in the car....tehre were 2 teenage boys there for tehire learners permits who loved bentley so i told tehm tehy cou d go get teh other 2- they were thrilled-- so now we were 3 danes, about 40 people waiting-- and 12 officers..
by now i had quite a crowd enjoying even chaos - and teh manager came over-- i quickly said- "if you have any problem with these dogs, i will either make them lie down or get the m out of here" -- he said no--- we are all dog people and the dogs were a good thing for all these people to enjoy while we sat there for hours. he watched as i let them wander "off leash" and tehy moved very slowly-- working the crowd- as tehy do when judy and i go to the adult day care centers... i watched pretty carefully for anyone to be afraid- and tehre was no one- the 3 dogs were just wandering very slowly- and even one woman who said she was usually afraid of dogs was patting sizzle as bentley sat in someone else's lap. pictures were taken big time and apparelty were all over facebook - tehn the 3 laid down and fell asleep as people stepped over them--- i kept checking to see if anyone thought i should "collect them " and get them under control . i even had to tell bentley to "step back" out from between rows-- which he did very carefully-- boy was that impressive !! i gave out a couple dozen "poker-chip" business cards... we may have aquired one nice young man from swampscott-- ( a strong looking "kid" good as a volunteer lifter) i told him to find out who judy was so he could maybe get a ride from swampscott..
the other thing i learned is one more totally impossibel job-- worse than collecting tolls on a bridge--- and i did not see how it could be "mechanized"
" we are now serving P-14 at window number 2"
" we are now serving C-52 at window number 10"
" we are now serving R-23 at window number 6" on about a 2 minute rotation. it may be dull-- but it is a job- and i can not think of many reasons most anyone could not do it. one good thing that came of it....... i now know teh manager-- and he said whenever i came in to find him and he wold get me thru-- maybe he was being kind--- maybe he was afraid i would bring all 50 dogs with me. at any rate -- i can get thru there now. i am back on my lifesavor program... i began to run out-- and my supply was just reinforced at mail call... yesterday stop and shop is out on strike with strikers all over the road and tehre was a policeman at either end of the group-- i had time to get the roll of life savors ready-- as i gave one to the first guy... he laughed and said "i needed that"
well i am certainly glad- with teh help of teh cp who gave me those... i could deliver !! i have heard a rumor that bella ( of bella and george -- abc news fame..) is now home schooled--- i would love teh details if possible-- i know she had trouble getting locked in a broken school elevator without her attendent -- plus-- the elevator had been inspected and rejected-- and did not even have a way to alert anyone that they were stuck -- she used her phone to call mom-- who called 911 - and it involved george having to make a 4 foot jump out - because teh fie department could not get it level on a floor???? so now what is going on???? only if possible for public distribution??????? AWWWWW SHUCKS--IT WAS NOT KONE ELEVATOR IN THE CATHEDRAL FIRE- OUR VERY EFFICIENT RESEARCH TEAM OF CAMERA PEOPLE FOUND SEVERAL PHOTOS OF TEH ELEVATORS-- WITH THE NAME OF A GERMAN COMPANY ON THEM. -----I WAS ALL SET TO HAVE A FIELD DAY/. STILL..... I AM BETTER WITH 4 LETTER STUFF..
LIFE CHANGED WHEN WE GOT TO HAVING A BUDGET OF OVER $500,000 SO RREMAINING A CHARITY DEPENDED ON THINGS LIKE ... HEAVEN FORBID... hiring an AN ACCOUNTAnt-- an excell spread sheet was no longer sufficient- altho alot easier to maintain and understand- when i needed a financial reeport , all i had to do was bring up sdp bank accounts on the screen and take a SCREEN SHOT of teh balances-- that was real life--- so now we have an accountant who puts out financial statements whicH accountants can understand----that don't even resemble my photo balances----- which are FACT--- but the authorities are happy. asking all our cp community to get other people addicted to watching the cameras is about as far out as i am currenty willing to go. doubling our viewership is a perfectly good goal to set..
so have at it.-- got to keep the board happy. "More significantly, however, Colorado does not currently enforce a waiting period on gun purchasers. Anyone 18 years of age or older can walk into a shop in Colorado right now and walk out with a gun in the same transaction. If there had been a mandatory waiting period allowing for a thorough background check, Pais and the danger she posed might have been substantially lessened."